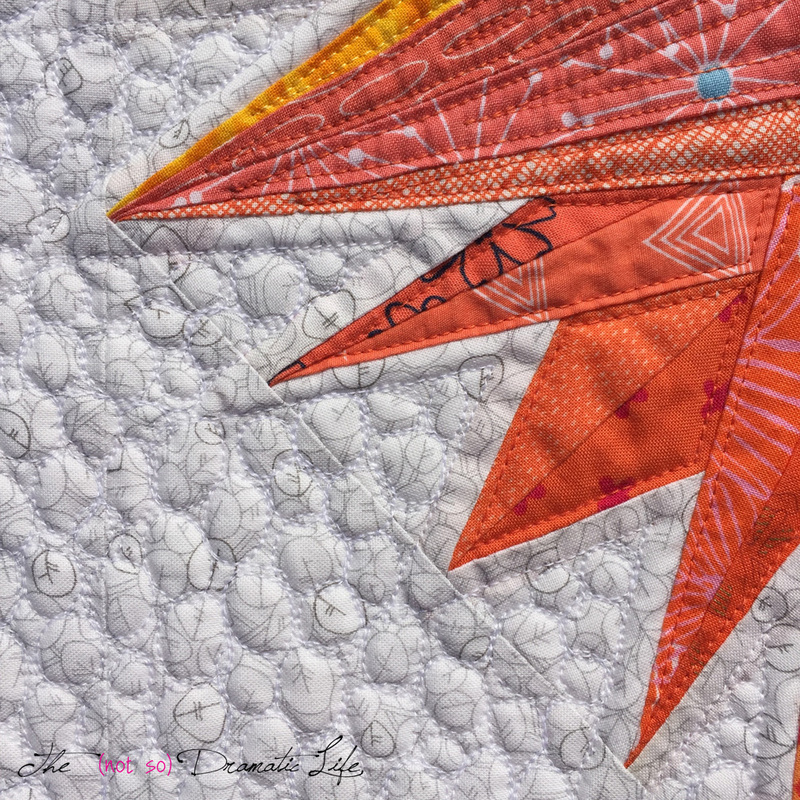 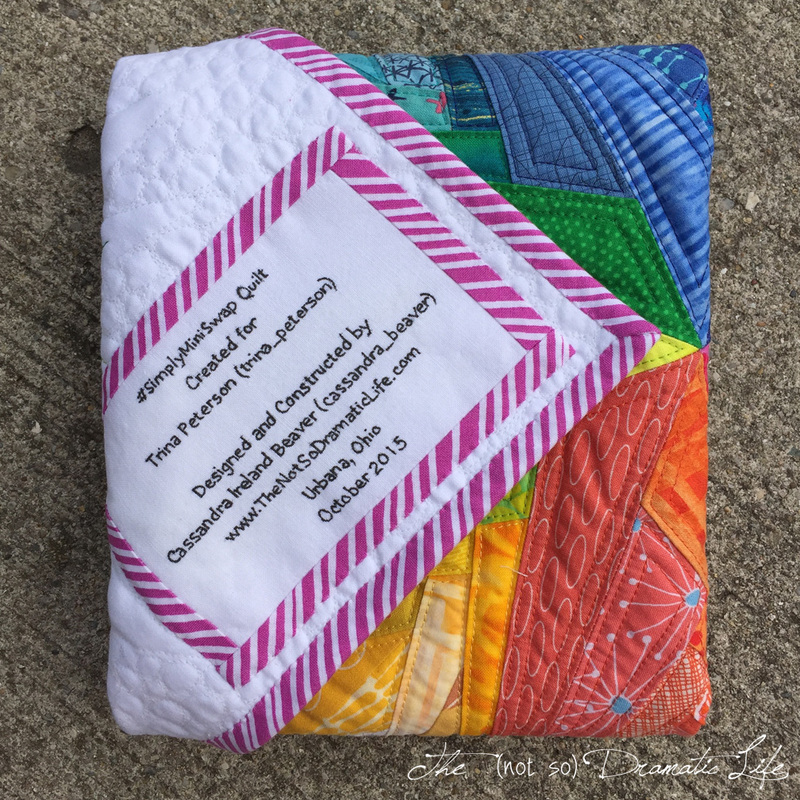 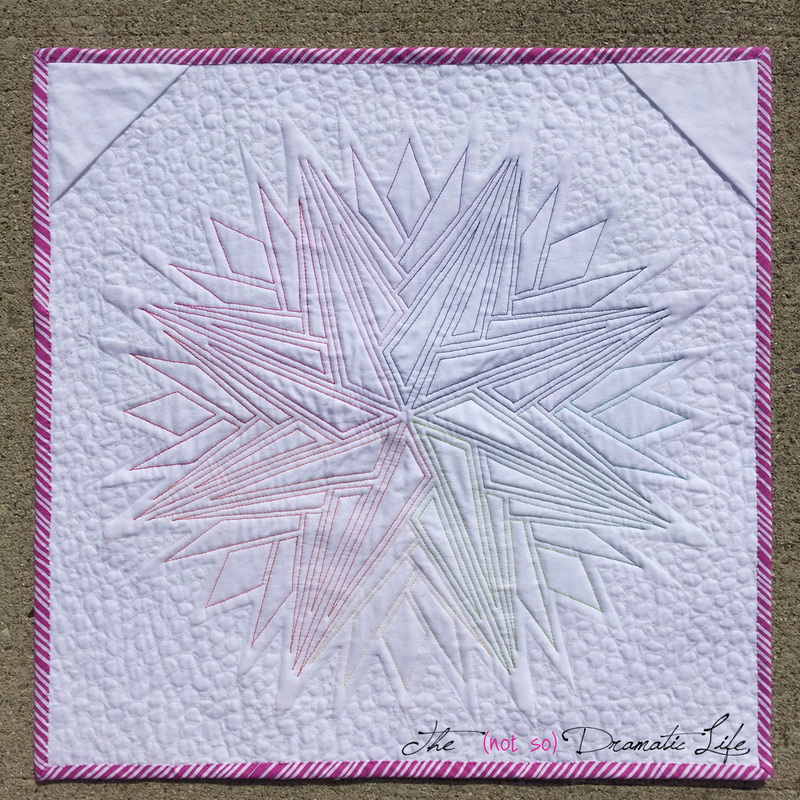 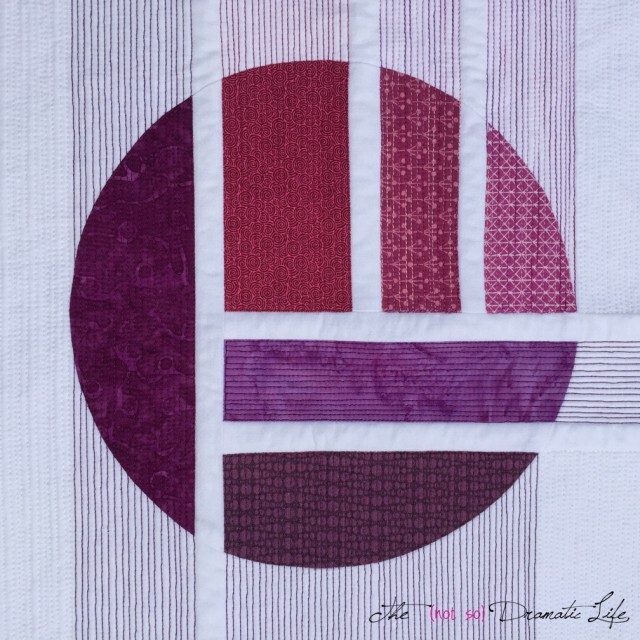 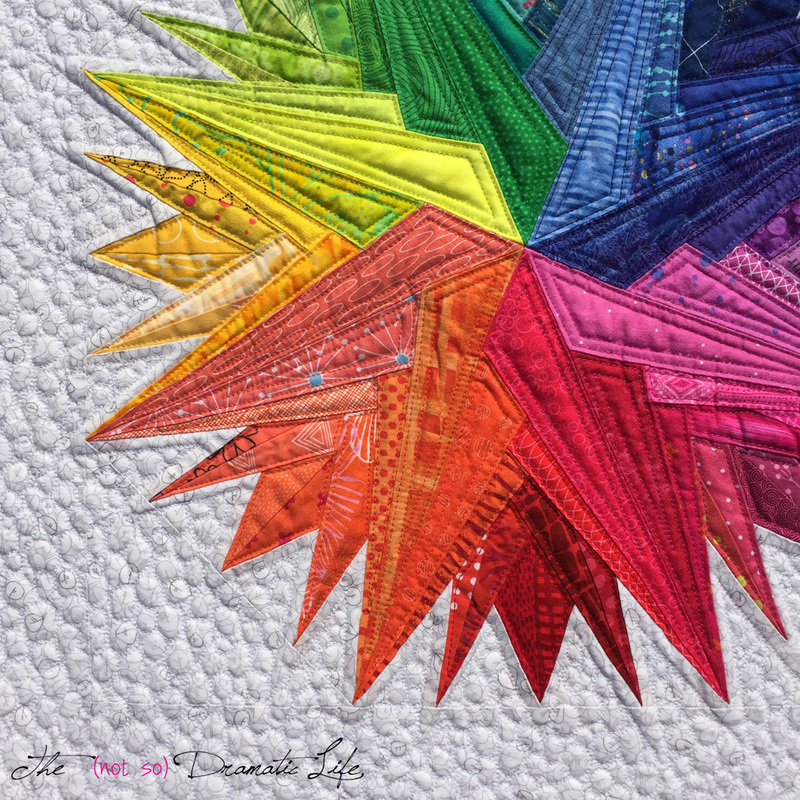 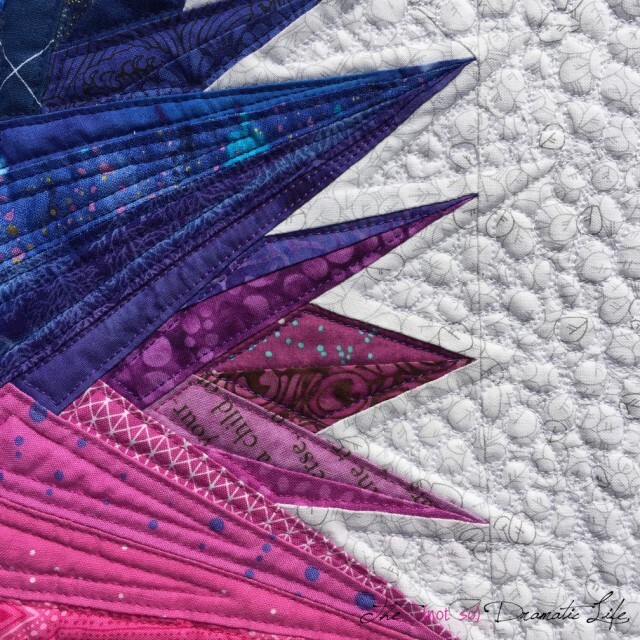 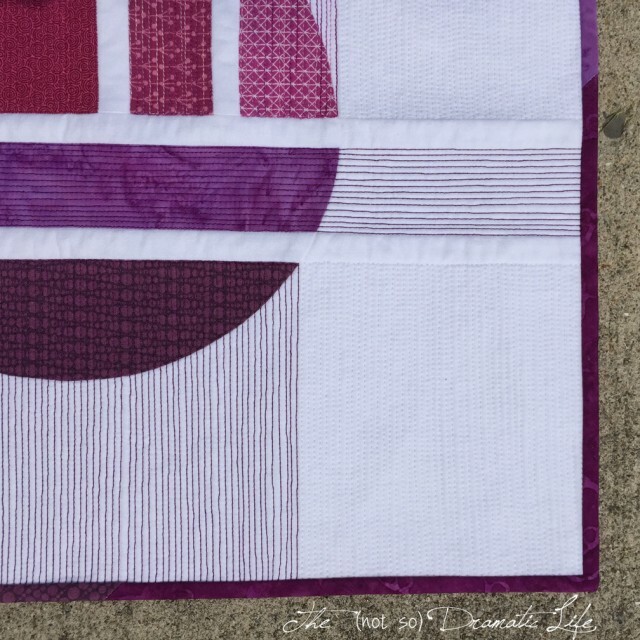 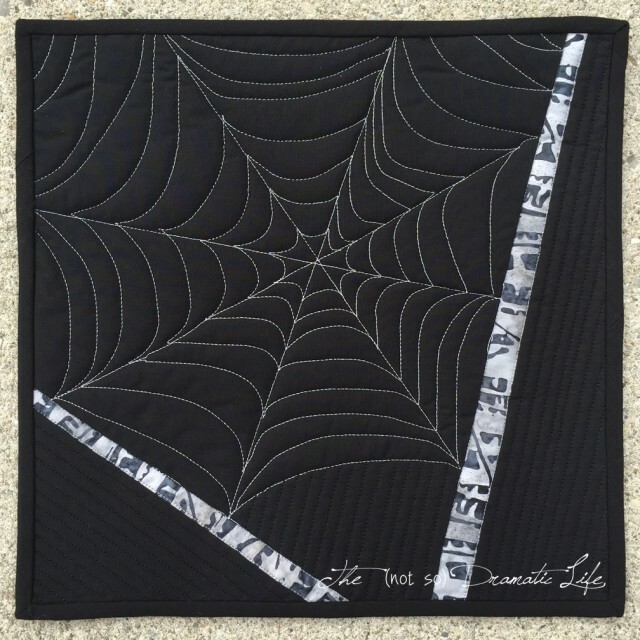 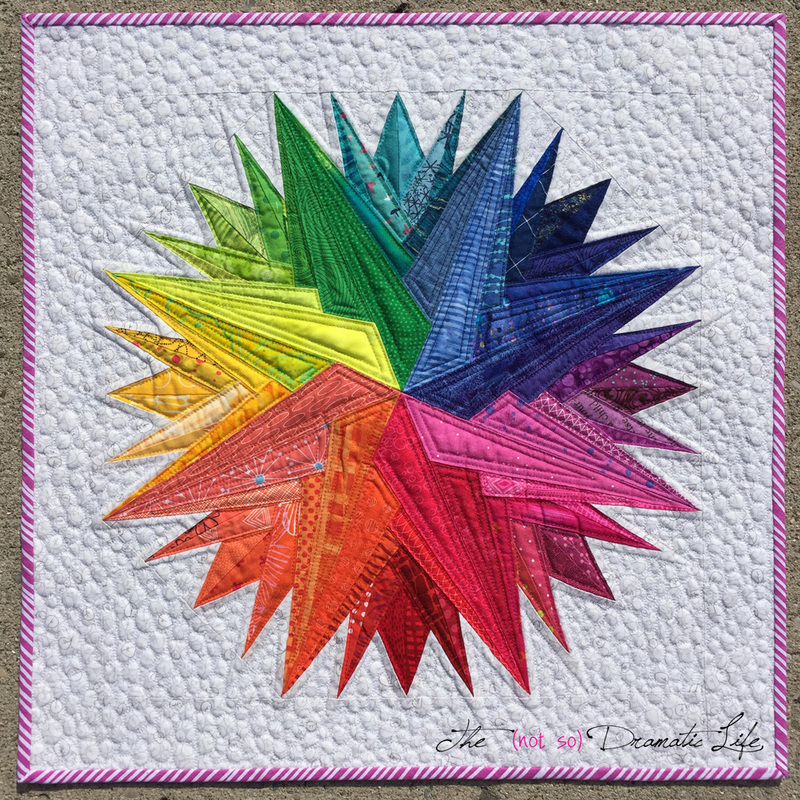 Violet calm is one of my favorite designs in the past few months, and I am excited to share it with you as my entry in the Modern Category for the Blogger’s Quilt Festival hosted by Amy’s Creative Side. 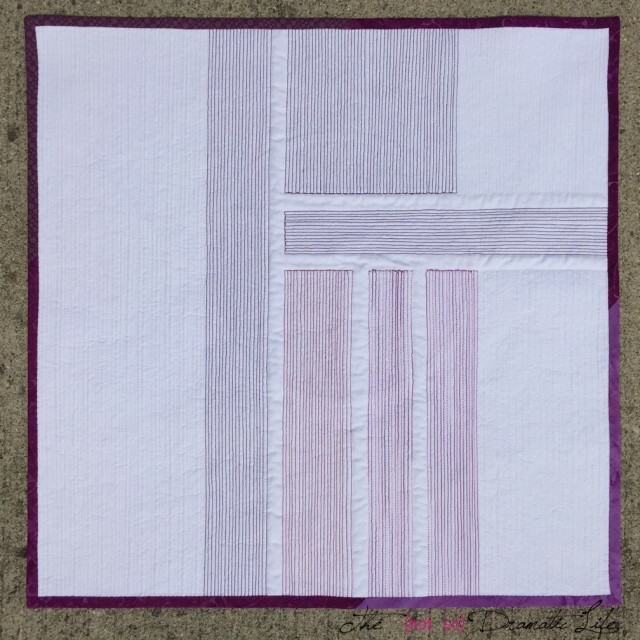 This design was created by piecing fabrics of several shades of violet together with thin strips of white Kona Cotton between each segment. The circle was cut from this pieced section of fabrics. Another circle was cut into the white background fabric, and the violet circle was machine pieced into the background. 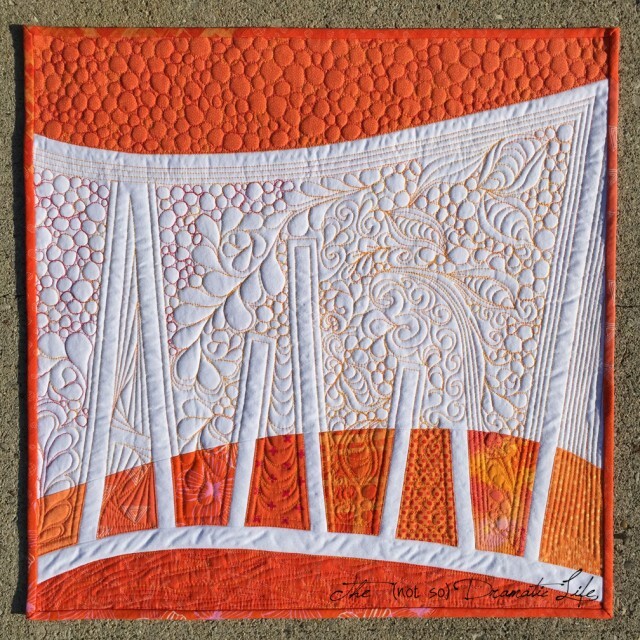 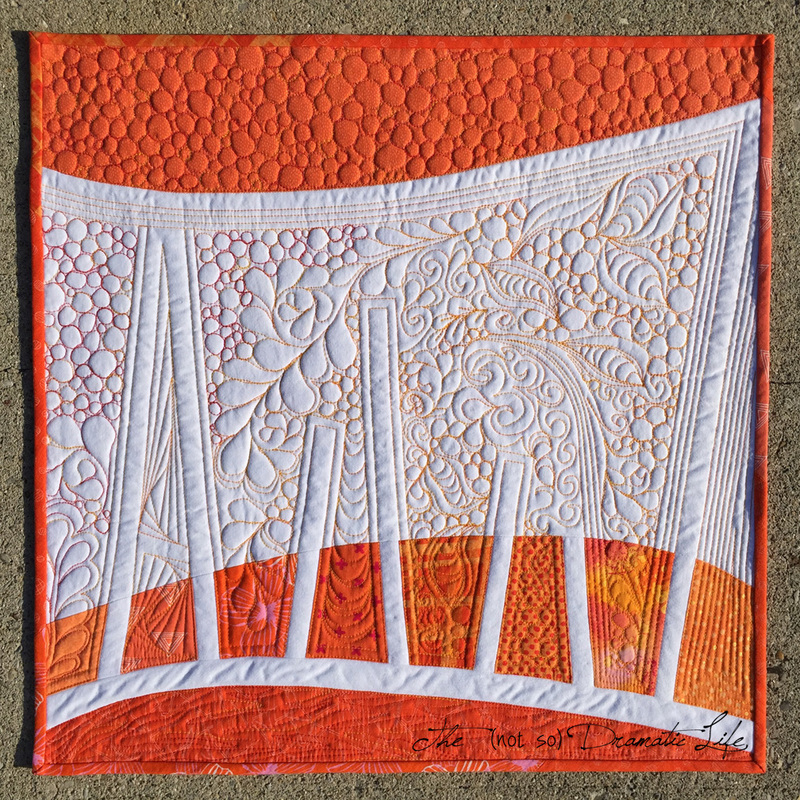 The matchstick quilting in this piece is done in the color of the fabric it passes through. 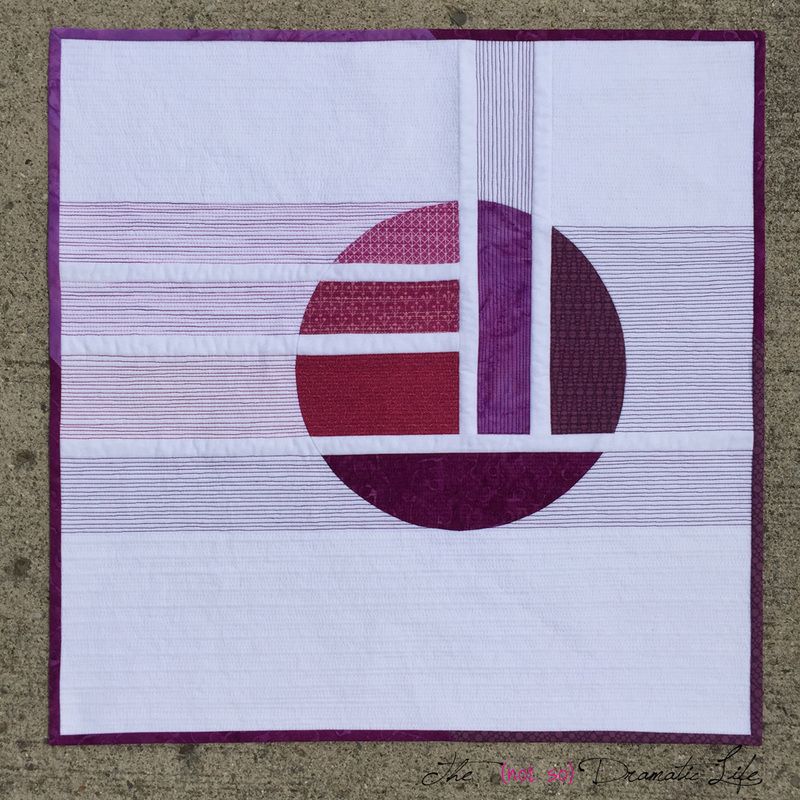 The horizontal lines create a sense of calm, and the variety of thread colors help to visually extend the centralized image across the quilt. 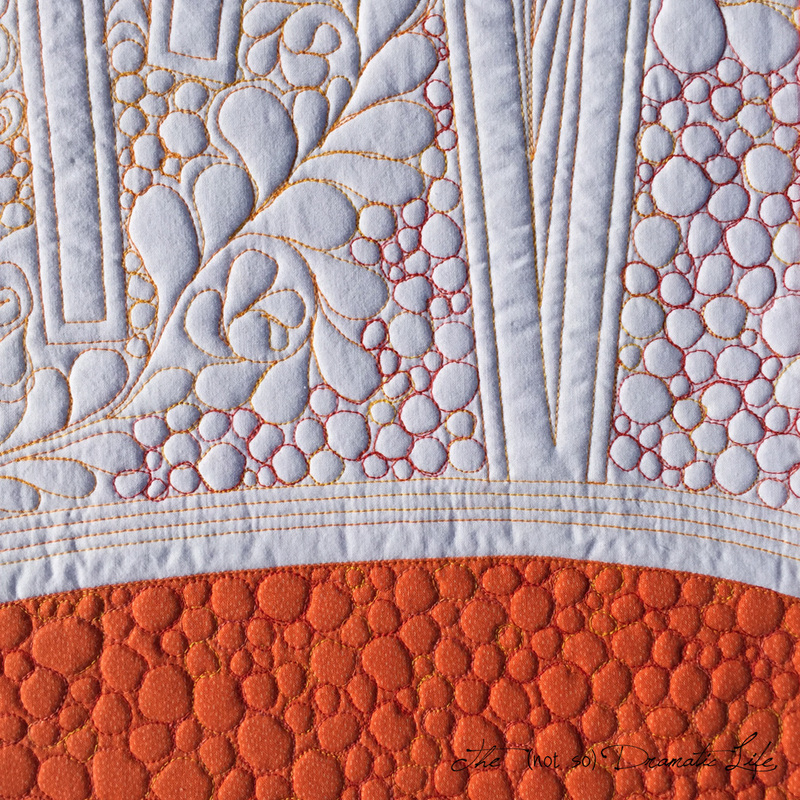 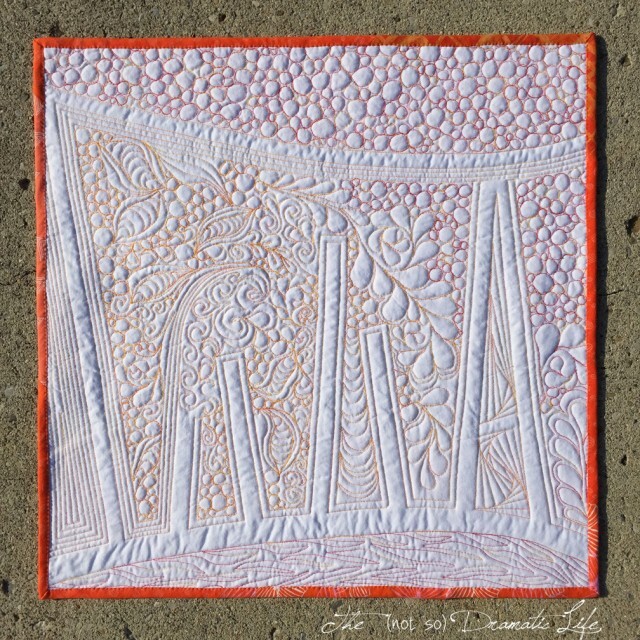 A single section of vertical quilting gives a quiet energy to this peaceful image. The binding is made of scrappy violet fabrics to frame the expanse of white fabric. 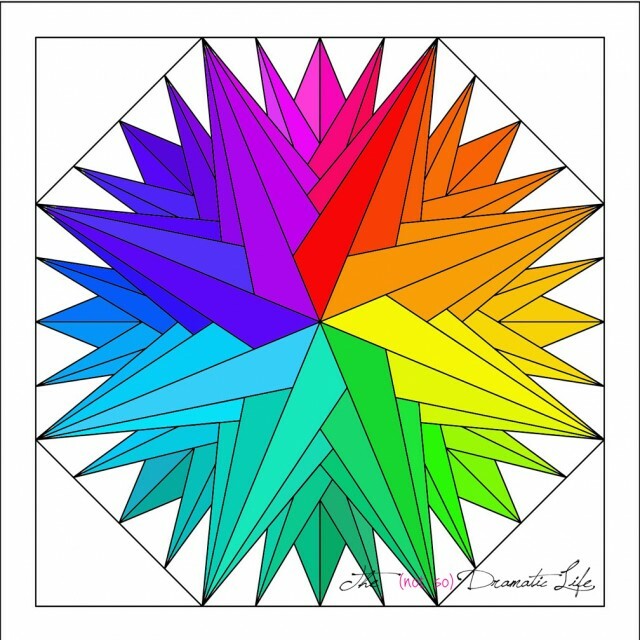 If you would like to read more about “Violet Calm,” please check out its original post. Thank you so much for stopping by! 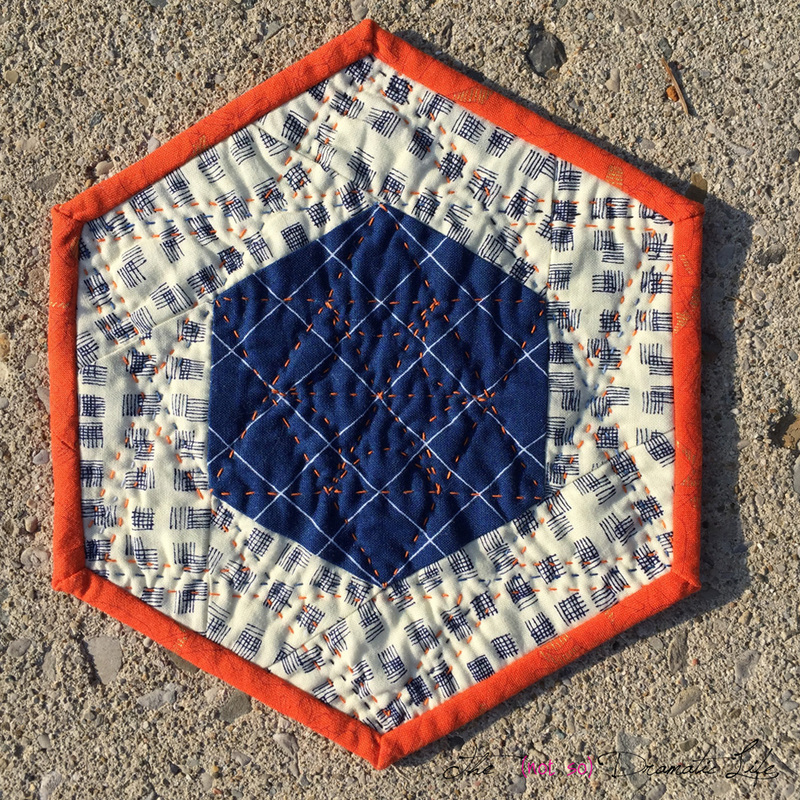 Hand quilting is something I haven’t done in many years, and I have never given Sashiko a try, so I thought that this would be a fun thing to experiment with for this mini. 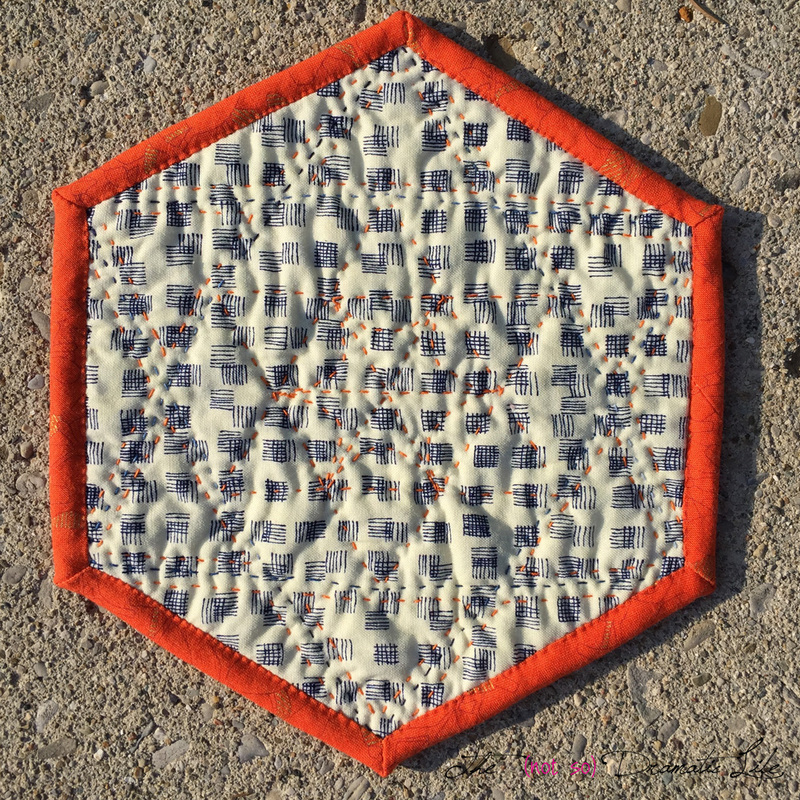 The central hexagon was the first thing I have cut using my Hex N More ruler. I have much bigger plans for this ruler, but I was still excited to take it for a spin with this project! 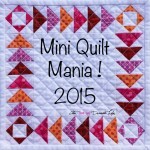 The quilting is the real star of this mini. 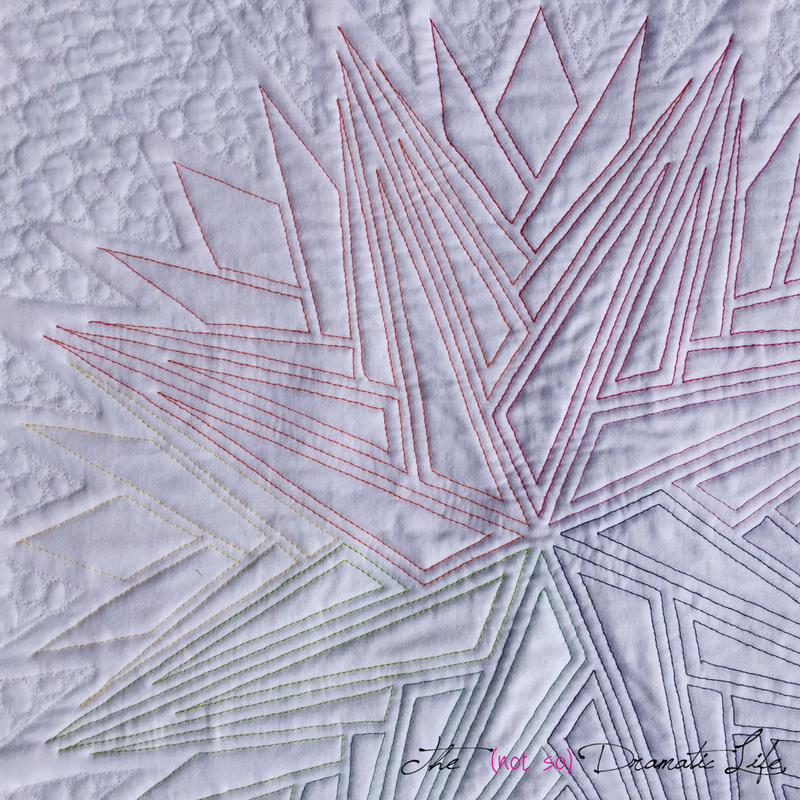 I chose simple prints with the hope that the stitching would be visible, but any uneven stitches wouldn’t be glaringly obvious. 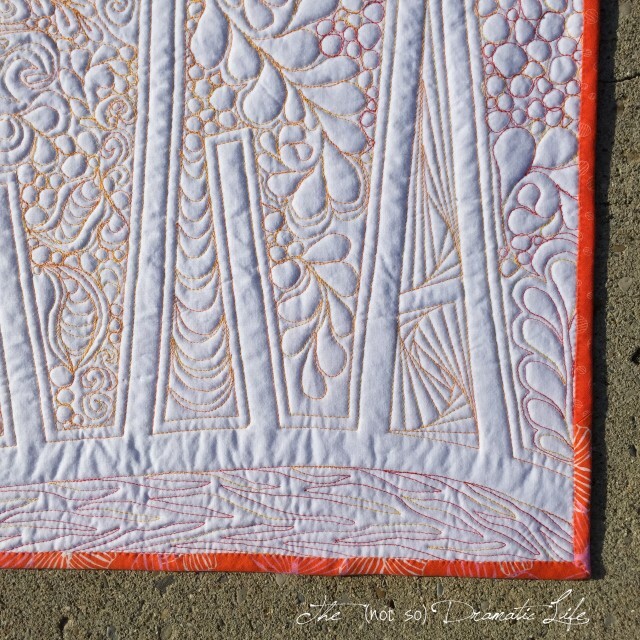 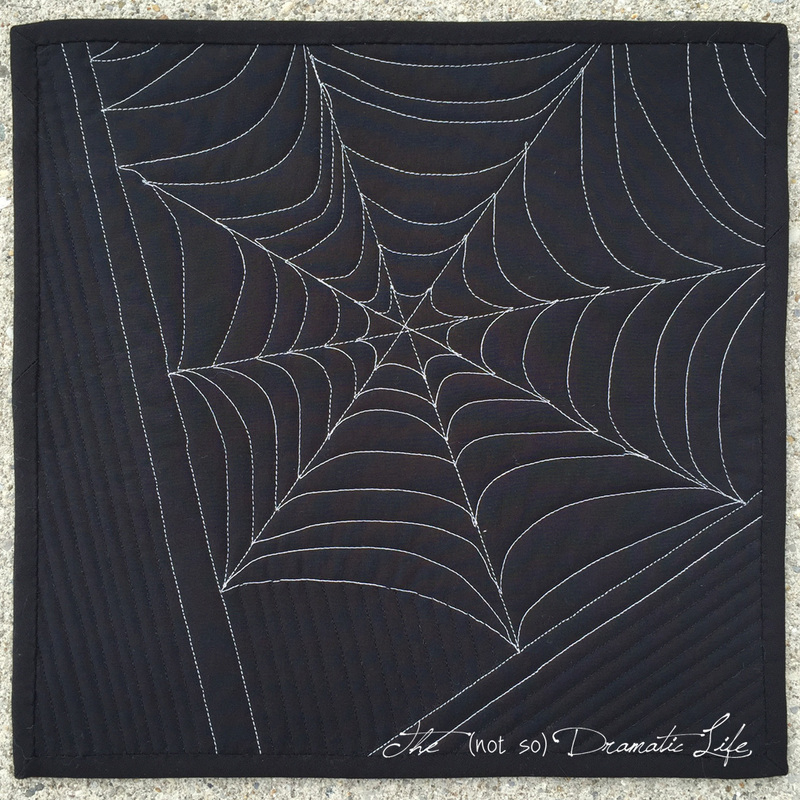 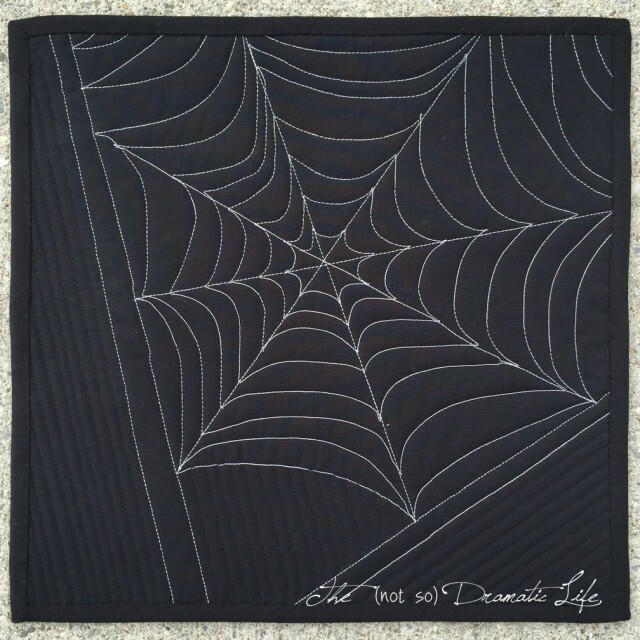 When I first learned to quilt it was OK to machine piece a quilt top, but actual quilting stitches were done by hand. You were supposed to aim for 10-12 perfectly spaced stitches per inch. 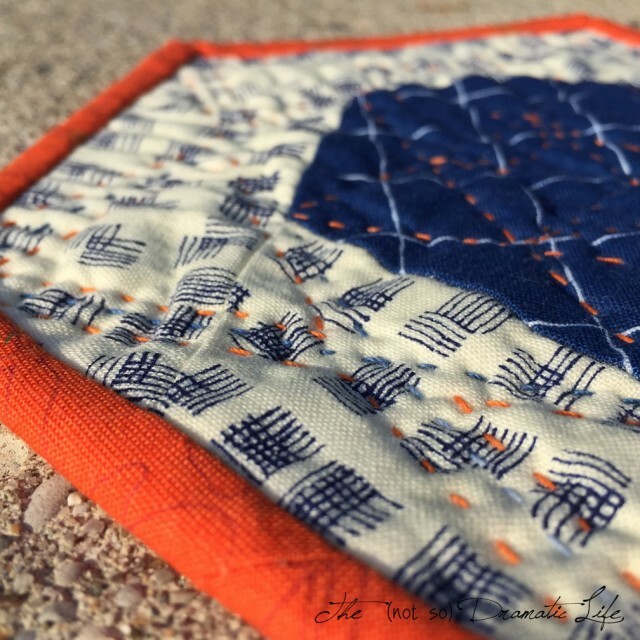 For me, part of the challenge in Sashiko is allowing myself to take larger stitches. 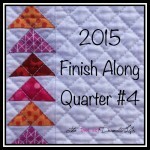 To help accomplish this, I chose 12wt thread and a slightly longer needle than I would normally quilt with.